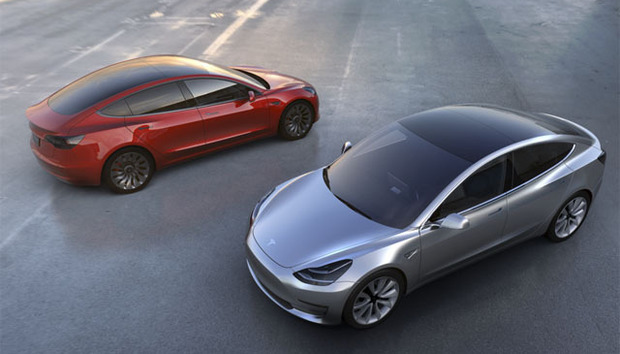 Tesla CEO Elon Musk last night unveiled the long-anticipated Model 3, a four-door mid-size sedan that takes aim at the mass market in ways unlike the all-electric vehicles (EVs) Tesla has released to date. The Model 3, which won't ship until mid-to-late 2017, has a starting price of around $35,000. That contrasts starkly with other Tesla sedans, which have a starting price of about $70,000. And, Musk said, it will be one of the safest cars in the world. That's because the Model 3 will include Tesla's Autopilot feature. That $35,000 price tag, before government EV tax incentives, means the Model 3 beats rivals such as the BMW 3 Series, according to Chris Robinson, an analyst with Lux Research. "Just a base 3 Series with no options and the smallest engine is priced at $33,000. In both looks and performance this is a car that can certainly compete with that," Robinson said. The Model 3 is squarely targeted at not only the 3 Series, but other low-end luxury cars, such as the Mercedes C Class, with a starting sticker price of $38,950, and the Audi A4, which starts at $37,300. BMW's new i3 EV is a two-door compact with a starting price of $42,400 that gets 81 miles on a full charge. And there are other, less-luxurious EV rivals. Chevrolet's 2017 four-door Bolt EV, which can travel about 200 miles on a single charge, will have a starting price of $37,500. The 2017 Chevrolet Volt LT, also a plug-in hybrid sedan, will start at $34,095, while the Premier model will start at $38,445. With a federal EV tax credit of $7,500, the Model 3's total cost may fall well below $30,000 -- and that doesn't include state tax credits. The Model 3 can travel up to 215 miles on a single charge and go from 0-60 mph in less than six seconds. The entry-level Mercedes C-class moves from 0-60 mph in 6.3 seconds. "The thing about electric cars is they're quick. Electric vehicles have instant torque, which internal combustion engines don't have," Robinson said. "When it comes to acceleration, it's tough to beat an electric vehicle." Like Tesla's other vehicles, the Model 3 will be able to use the company's long-range Supercharger network, which informs drivers where the nearest chargers are located. Displaying those charging stations is Tesla's tablet-sized infotainment system. Some pundits are calling the vehicle "the most important car Tesla has ever made," and judging by the number of pre-orders, they may be right. "It's astonishing that people would put down $1,000 before even seeing the car," Robinson said. "Consumer enthusiasm for Tesla has always been very high. It's like the Apple of the auto world." A look at the interior of the Tesla Model 3 with its tablet-sized infotainment system. "If there's that many people willing to put down $1,000, that's the indicator that they hit it right," said Egil Juliussen, director of research for Infotainment & Advanced Driver Assistance Systems at IHS Automotive. Prior to the launch yesterday, Evercore ISI analyst George Galliers had predicted about 55,000 preorders in the first 72 hours and a little more than 117,000 orders by year's end, which he said would be a "huge achievement." Tesla is "a compelling product," Galliers said, alluding to the fact that despite low oil prices, the companies EVs are still attracting consumers in big numbers. The Model 3's EV batteries have to get a lot cheaper by 2017 if the vehicle is to live up to its billing, according to MIT's Technology Review. Tesla's lithium-ion vehicle battery represents a quarter to a half of the total build cost of the Model 3, according to MIT. Musk's plan is to ramp up battery production at "Gigafactories," like the $2 billion, 10 million-square-foot factory being built outside of Reno, Nev., and use economies of scale to reduce the cost of EV batteries about 40%. "Certainly the batteries are expensive, but that's part of the motivation of the Gigafactory achieving economies of scale," Robinson said. Along with the Model 3, Musk announced the Reno Gigafactory is already in production. Tesla has partnered with Panasonic to develop a new technology that combines silicon with the graphic lithium-ion batteries used in their anodes. "In order to produce a half million cars a year, we'd basically need to absorb the entire world's lithium-ion production. That's why we're building the Gigafactory. This is a vital element," Musk said. "The Gigafactory will have the largest footprint of any building of any kind. It will produce more lithium-ion batteries than all other factories in the world combined in this one location." "So we're talking about 50GW hours a year of production," he continued. "It will also be producing the most advanced cell and battery in the world. So, it's the combination of high volume and the most advanced technology that will enable us to make the Model 3." Tesla CEO Elon Musk discusses the now operational Gigafactory's role in producing low-cost lithium-ion batteries for the Model 3. Investors seem to agree that the Model 3 will be a big seller. Tesla's stock rose 8% (to $246 per share) shortly after markets opened today. By noon, that uptick had settled back to a more moderate 4% increase (at $237 per share). Like other Tesla vehicles, such as Model S, the Model 3 supports over-the-air software updates. It will also feature Tesla's Autopilot safety features, such as lane-keeping and adaptive cruise control. Tesla has a enormous advantage over traditional carmakers because it is able to use more modern electronics, according to Juliussen. Traditional automakers use a three- to five-year vehicle design schedule, meaning once they choose an electronics platform for the infotainment system and other electronic control units, it's set in stone and the electronics could be years-old by the time a vehicle hits the market. "Tesla designs their electronics much closer to deployment time," Juliussen said. "That gives them a more advanced design for the electronics. It also gives you more performance, and more memory for the dollar. That's why I think they're able to offer Autopilot in the Model 3, which was a $10,000 upgrade on the Model S."
"I think they'll compete pretty well against other [carmakers]," he continued. "Someone may have a lower starting price, but then they don't have the Autopilot."